We've been having an awesome time camping, the weather has been great and Ezra has been his usual active, adventurous self, good thing he has lots and lots of people to give him all the attention (and food) that he wants!! Sometimes when we are camping I start feeling like we have an overload of meat and potatoes, the easiest thing to chuck on the BBQ is steaks or sausages, at home we only eat meat a few times a week so having so much meat makes me feel kind of gross. So tonight we tried something we have done in the oven before but never in the BBQ. They were delicious, and such an easy and light meal to make when your camping. Here is the recipe, we served them with brown rice and sweet potatoes, that is what you can see wrapped in foil in the picture. We used 7 capsicums, and this is the rough amounts of ingredients, it fed 6 adults and 1 toddler with leftovers, I would suggest just making it to taste though. 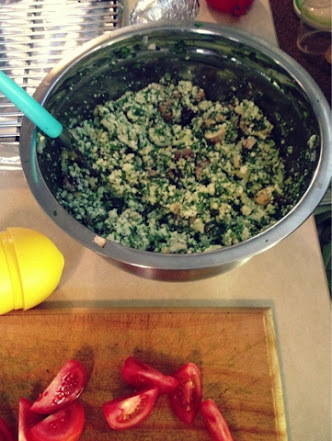 It's really simple, you halve the capsicums and then finely chop the spinach, mushrooms, onion and basil and stir it in with the ricotta. Then add the pine nuts and salt and pepper to taste. 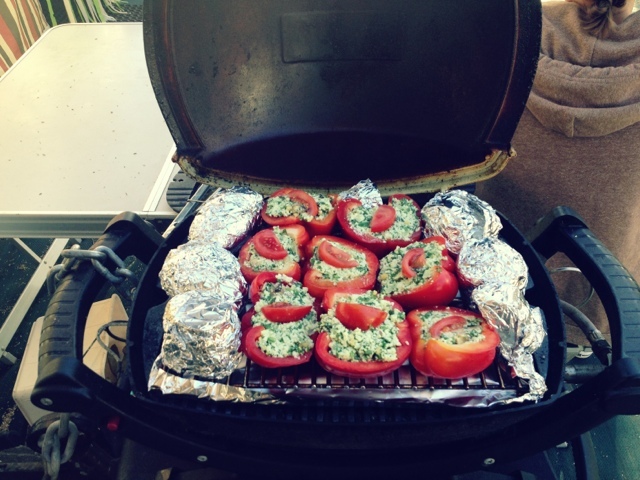 Add a slice of tomato to the top of each and place them on a tray or rack in your oven or BBQ on medium heat. You know they are done when the capsicums (peppers) are nice and soft and the ricotta seems cooked and not runny. 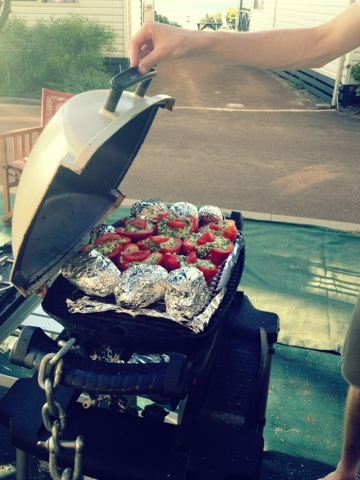 We have a Weber Baby Q which is perfect for these meals, but any BBQ with a cover would work! Of course I am linking up with the lovely Jess at Essentially Jess for #IBOT today too!! 10 comments on "Stuffed Capsicums and Brown Rice"
yum yum yum!!! Oh I love stuffed peppers!! :) Hubby isn't sure of ricotta so might have to find something different to use!! Rice perhaps.. :) We have a huge bbq thats not easy for quick meals.. I think a baby Weber Q will be on our list of things to buy this year!! They look delicious! Anything with ricotta has be already drooling. These look divine and so colourful. Oohhh... these look very tasty! Yum! I know, I'm a sucker for ricotta too!!! Haha my American husband struggles with that too, and always sounds kind of awkward when saying it! Yes do it!! You'll love them! Regular snags are pretty delicious though!! And hassle free!